The Lewis Center for the Arts at Princeton University will present a special preview screening of the new PBS Civil War era drama series Mercy Street on Monday, December 7 at 7:00 p.m. in the James M. Stewart ’32 Theater at 185 Nassau Street. The screening, preceded by a reception beginning at 6:15 p.m., is free and open to the public, however advance reservations are encouraged. Set in Virginia in the spring of 1862, Mercy Street follows the lives of two volunteer nurses on opposite sides of the conflict; Mary Phinney (Mary Elizabeth Winstead), a staunch New England abolitionist, and Emma Green (Hannah James), a naive young Confederate belle. The two collide at Mansion House, the Green family’s luxury hotel that has been taken over and transformed into a Union Army Hospital in Alexandria, a border town between North and South and the longest-occupied Confederate city of the war. Ruled under martial law, Alexandria is now the melting pot of the region, filled with soldiers, civilians, female volunteers, doctors, wounded fighting men from both sides, runaway slaves, prostitutes, speculators and spies. The series will begin airing on PBS stations nationwide January 17 at 10:00 p.m. The event at Princeton will include a preview screening of highlights from Season 1, followed by a panel discussion. Historians James McPherson, a Princeton faculty member emeritus, and Audrey P. Davis, and cast members Josh Radnor (How I Met Your Mother) who plays Jedediah Foster, McKinley Belcher III (Show Me A Hero, Chicago PD) who plays Samuel Diggs, and Tara Summers (You’re the Worst, Rake, Boston Legal) as nurse Anne Hastings will join Mercy Street writer, producer and showrunner David Zabel, Princeton Class of 1988, in a post-screening conversation. Lewis Center faculty member Christina Lazaridi, a screenwriter herself, will moderate. 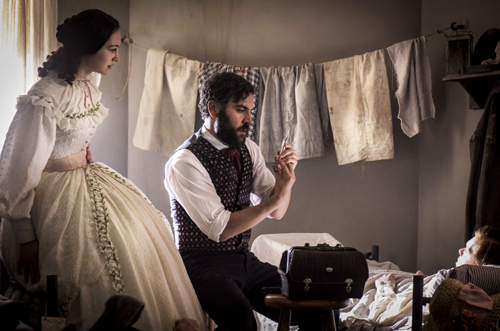 Mercy Street is the first new American-produced drama to air on PBS in more than a decade. The series also stars Norbert Leo Butz (Bloodline), Gary Cole (Veep, The Good Wife, Entourage), Peter Gerety (Syriana, Charlie Wilson’s War, The Wire, Prime Suspect), Shalita Grant (NCIS: New Orleans, Bones), Hannah James, Cherry Jones (24), Josh Radnor (How I Met Your Mother, Liberal Arts, Broadway’s Disgraced), and Mary Elizabeth Winstead (The Returned, The Spectacular Now). Executive producers include Ridley Scott and David W. Zucker of Scott Free, Lisa Q. Wolfinger, and David Zabel. Tickets may be reserved at arts.princeton.edu/mercystreet.